Fourteen-year-old Kentucky native Gabrielle’s favorite subject is geography, which is appropriate when you have an insatiable desire to travel. Gabrielle, who has spinal muscular atrophy (SMA) Type 2, has already seen a great deal of the world, including Europe, the Caribbean and the western United States. This year, Gabrielle is featured as a “Shamrockstar” on a platinum custom MDA Shamrock at retailers across the country, a country that Gabrielle has seen extensively in her travels with her family. These trips have enabled her to experience many different cultures and landscapes. Being in a wheelchair has provided the occasional challenge, but Gabrielle and her family have learned how to be creative in dealing with logistical difficulties. These family trips take on added significance considering the prognosis Gabrielle was given when first diagnosed. Aurlisa took her to the pediatrician, who was not overly concerned, telling her to monitor her progress over the next three to six months. However, there would be no improvement. Growing concerned, Aurlisa pushed to have a battery of tests done at nine months instead of waiting until Gabrielle’s first birthday. She took her to a variety of specialists, and, three months later, Gabrielle was formally diagnosed with SMA Type 2. Aurlisa remembers the shock of the diagnosis, but she remembers even more vividly the response of the neurologist. “I asked him, ‘What can I do?’ He said to take her home, make her comfortable, because most kids with this disease don’t live past two. He said to take her to Disney World, since Make-a-Wish lets you go. Soon after, Aurlisa began taking Gabrielle to the MDA Care Center in Louisville, where Gabrielle has been receiving her treatment ever since. Seven trips to Disney World later, Gabrielle is now a high school student in Louisville, pursuing her passion for singing. Gabrielle recently enjoyed her first MDA Summer Camp and is already looking forward to going this year. Last year she attended camp for the first time, and this year will be going to camp in Antioch, Tenn., outside of Nashville. 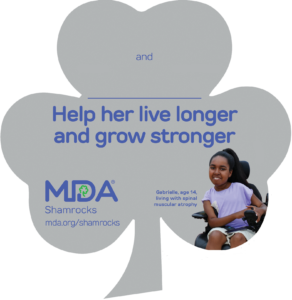 So far, Gabrielle and family have visited several Kroger locations, a company that has been a staunch supporter of MDA Shamrocks. They have also visited White Castle and Drybar, a well-known salon in Louisville. Gabrielle is excited for the opportunity. “With Shamrock season coming, we are excited to be on it, to be able to go, talk to folks and show that she’s on there,” says Aurlisa. In addition to providing the opportunity to send local kids to MDA Summer Camp, Shamrocks go a long way towards funding critical care that helps improve the quality of life for kids like Gabrielle. “The support matters,” says Aurlisa. “When [someone invests] in that Shamrock, they invest in kids’ abilities, even if for a week, to have a sense of freedom, independence, and peace for their families, who get a break.